Wildwood, MO – Ski resort operator Peak Resorts, Inc. has released results for its fiscal third quarter and nine months ended January 31, 2017. Third-quarter results, which include New York’s Hunter Mountain in the three and nine months ended January 31, indicate that the company’s revenue increased 46% to $56.4 million, compared to $38.7 million for the third quarter of fiscal 2016, when snow conditions were dismal in the northeastern U.S. where the majority of the company’s earnings are realized. Resort operating expenses were up $8.3 million over the third quarter of fiscal 2016. Net income was $8.2 million, or $0.58 and $0.47 per basic and diluted share, respectively. Reported EBITDA improved 78% for the quarter to $19.9 million, up from $11.2 million during the prior-year period. Peak Resorts include Mount Snow in Vermont; Attitash, Wildcat and Crotched Mountains in New Hampshire; Hunter Mountain in New York; Jack Frost and Big Boulder in Pennsylvania; Alpine Valley, Boston Mills/Brandy Wine and Mad River Mountain in Ohio; Hidden Valley and Snow Creek in Missouri; and Paoli Peaks in Indiana. 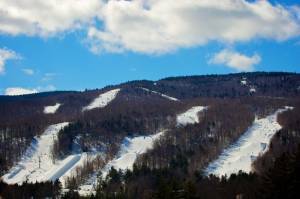 EB-5 project funds were released on December 22, 2016, allowing for an improved balance sheet, as well as continued project development on Mount Snow’s West Lake Water Project and funding for the Carinthia Ski Lodge Project. A quarterly cash dividend of $0.07 was reinstated on outstanding common stock.